BURBANK, Calif. (KABC) -- Four lanes of the eastbound 134 Freeway at the 5 Freeway interchange in Burbank were blocked following a multiple-car crash, which caused a traffic backup for miles Friday night. The crash was reported around 7:50 p.m. and only the carpool lane was left open as authorities gathered at the scene. It was unclear how many cars were involved in the crash or how many people may have been injured. The SigAlert was issued for an unknown duration of time. 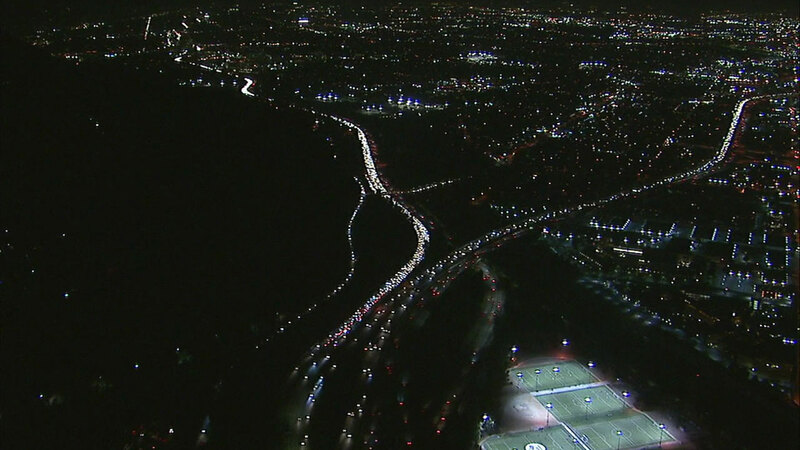 Footage from AIR7 HD showed a long line of white lights on the eastbound 134 Freeway as cars slowly trudged through the single-lane roadway. All lanes were reopened by 9:45 p.m., according to the CHP.